Our project focuses on the mica mine that has shaped the economy of Sydenham. We examine how the Lacey mica mine and surrounding mines affected the economy and growth of the village. 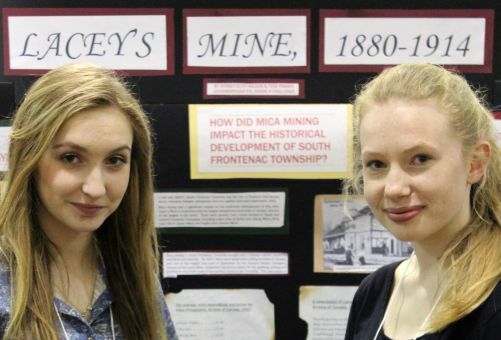 What has been the impact of the Lacey mine on Canadian history? Mining is extremely important to the development of Canada. The discovery of a mine attracted people to the area. The mines created jobs, and towns and villages were formed to support the new industry. Traders and merchants have moved to be near the workers in the mines. Several villages and even cities in Canada exist due to the mining industry. Why should we care about Lacey’s Mine today? It is important to know the origins of your community. By searching our town or village, we can discover the origin of waterways, buildings and street names, as well as what drew its inhabitants. Many people came to Canada because of the jobs offered by the industries related to mining. Mining remains today an important part of the Canadian economy. Sydney and Tess won the gold medal for grade eight.